Fewer things are more satisfying than arriving at your home, and finding men on the roof. 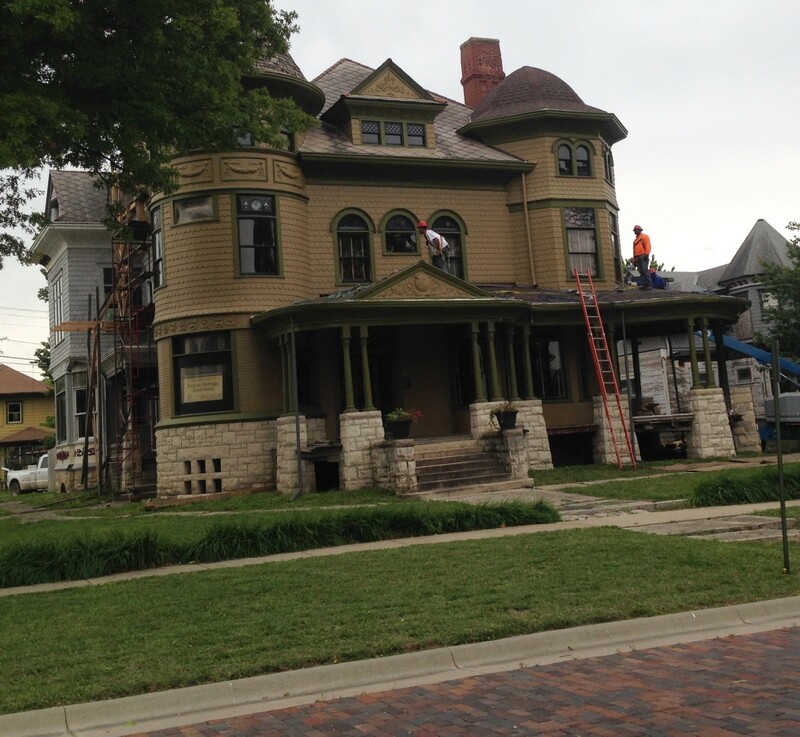 Groh & Sons are now working on the main porch roof. 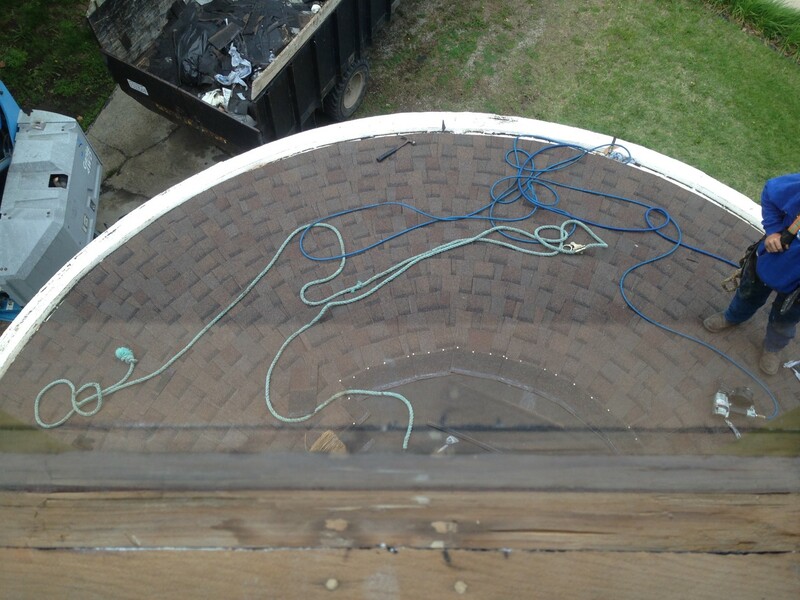 You see see the completed octagon tower roof. Whoee! The turret roof is next!!!!!!!! I was highly focused on making sure that the shingles curved to meet the outline of the porch. It had been done in pie-shaped sections, with the shingles running straight, and this is commonly seen as it is much easier to do. But…the horror! The horror! Chris is pictured. “Yep, it is hard to do it this way,” he said. I did however detect a subtle satisfied smile. The results though look great! Thanks, Chris! This is taken from the third-floor octagon tower. The white line is the built-in gutter; the white cannot be seen from street level. 6 Responses to More Roofing! That shingling is a work of art. Have you thought of asking all the workers/artisans who have worked on your restoration to sign something — like a piece of wood — that you can frame and display somewhere in the house? 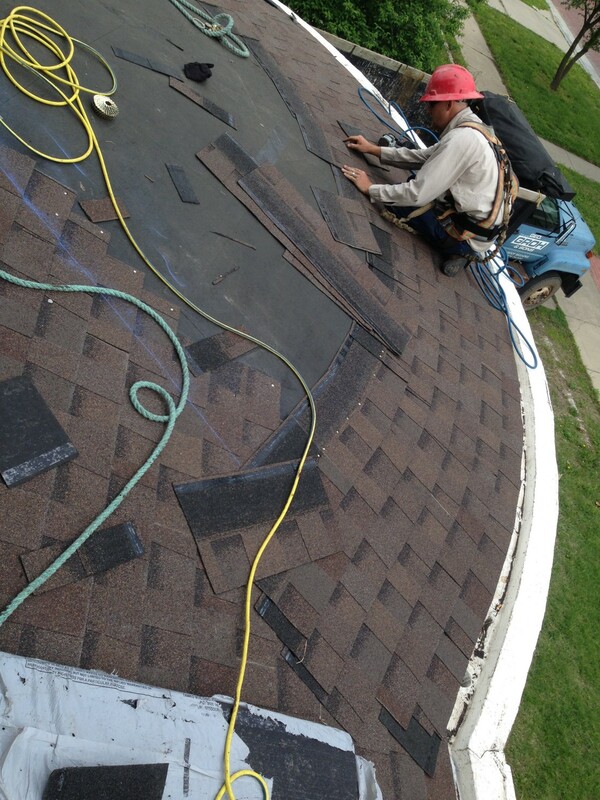 You’ve worked with some of the best boiler guys and roofers in town. It would be cool to acknowledge their contributions, because I’m betting they’re really proud of what you all have accomplished together. And wonderful that you made sure the shingles are curved to match the outline of the porch – perfecto delecto. A huge task and fantastic roofing job! Very impressive!